With an empty weight of 54 pounds, the quadcopter made by Indiana’s VertiPod, a division of Pete Bitar’s company AirBuoyant (which also builds the Bede Aircraft BD-28) will require an exemption for almost any payload, but the payoff is a “pickup truck” that can fly on lithium-polymer battery power at 200 pounds. 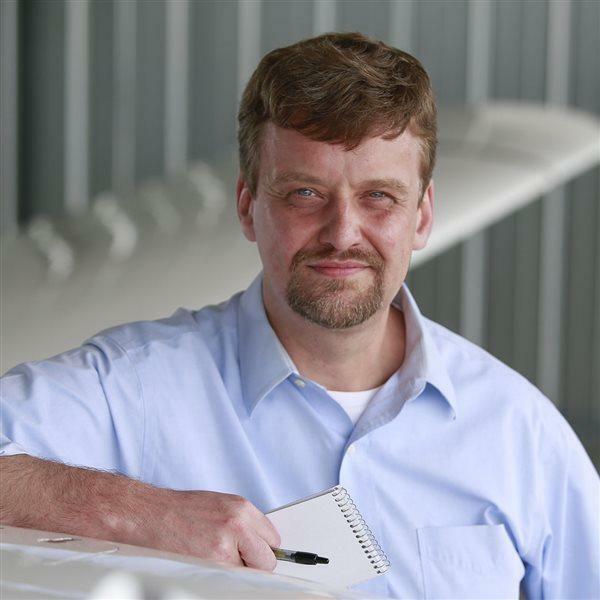 Pete Bitar, founder of the Indiana company AirBuoyant and inventor of the VertiPod quadcopter made for heavy lifting, said he scarcely got a chance to sit during the week of EAA AirVenture, with so many visitors to the company display. Jim Moore photo. The Spartan looks of the VertiPod IV (the company also is developing a hexacopter version) are in keeping with a design that’s all about utility, made to haul heavy loads for a range of missions that include agriculture, search and rescue, and aerial cinematography. Bitar said the VertiPod can carry an Imax camera, though agriculture is emerging as the leading mission type, given the demand for heavy payloads for crop treatment. “Our sweet spot is about 150 pounds,” Bitar said. At that weight, there’s enough liquid in the (optional) sprayer to cover about five acres of farm fields with 20 minutes’ flight time. A pollination mission, which involves a somewhat lighter load flown at a higher altitude, could cover 800 acres in the same time, he added. Bitar aims to compete with systems made overseas that carry less weight at a higher cost. The VertiPod IV retails for $20,000, with an optional sprayer costing $2,000 and $1,500 for an extra set of batteries, a four-pack of 250 Watt-hour power cells, one for each motor. “We’re all-American made,” Bitar said. His debut at EAA AirVenture in Oshkosh, Wisconsin, proved a busy one, with many visitors to the booth inside the Drone Pavilion, and strong leads. Bitar’s company has been developing the unmanned systems for heavy-lift applications for a few years. Bitar flew volunteer Stephen West a short distance using a prototype in 2015.